Hungary's second 4Q17 GDP release came as no surprise, with the Hungarian Statistics Office (HCSO) leaving growth unchanged at 4.4% YoY. The details are also in line with expectations, as domestic demand remained the main contributor. On the production side, the HCSO highlighted the significant contribution from the construction and services sectors. The strong construction performance was in line with the pre-financed EU funds, the expansion of the housing market and the capacity enhancements in manufacturing. The increase of value added in construction exceeded the average growth of 2017, marking a 35.5% YoY growth rate in 4Q17. The contribution of this sector to GDP growth was 1.4ppt, despite its relatively small weight in the economy. 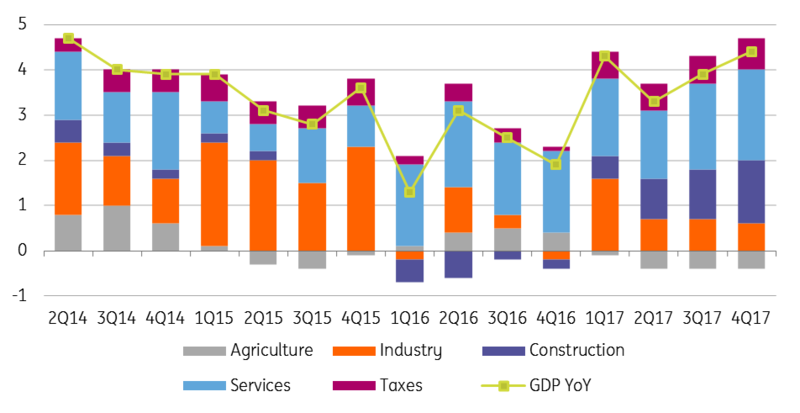 Regarding the service sector, a strong labour market boosted the consumption of services, resulting in a 2ppt contribution to GDP growth, the strongest figure since 4Q13. Industrial value added, despite a mixed performance, increased by 2.9% YoY, translating into a 0.6ppt contribution to GDP growth. Due to the strong base effect of 2016, which was a record year, and the rather below-average harvest, agriculture held back the expansion of the economy by 0.4ppt in the last quarter. On the expenditure side, the main drivers behind GDP growth have remained domestic factors. Actual final consumption contributed 4ppt, the highest since 2006. This is due to the significant pickup in household consumption although the expansion of government consumption also helped a lot, increasing by a whopping 8.8% YoY. This, however, follows a well-known pattern, coming just before the general election (April 2018). In line with the expansion in the construction sector, investments rose by 13.1% YoY. That reflected some slowdown on base effects but still added 2.9ppt to GDP growth. The domestic use added 4.8ppt to 4Q17 GDP growth. On the other hand, net exports were a significant negative contributor. Strong domestic demand strengthened imports, outpacing export activity. Even though exports regained some strength in 4Q17, overall net exports subtracted 0.5ppt from GDP. We expect economic activity to slow down in 1Q18 (mainly due to the base effect) but remain close to last year's performance on the back of positive momentum. As to the structure of our projected 3.9% YoY growth, we still expect domestic demand to remain the driver. We see upside risks surrounding our forecast, as the 4Q17 data was better than expected and we are getting closer to the general election. After the significant 4% YoY growth in 2017, we could see another year of near 4% economic activity. The big picture might remain the same, although we are expecting some shift in the growth structure. 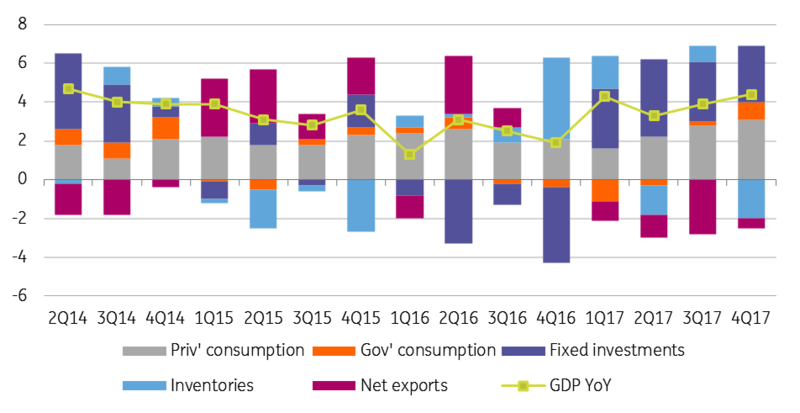 We expect the contribution from domestic demand to weaken somewhat due to the strong base effect (especially in investments). Investment activity will increase by around 8% YoY after a 17% jump in 2017, mainly due to infrastructure projects. Upside risks stem mainly from the soaring housing market. On the external demand side, we expect new manufacturing capacity to enhance export production gradually throughout the year. We see a high probability that net exports will contribute positively to GDP growth in 2018. Hungary: Four-year high GDP growth, but is the glass half empty?